Designed with a modern style and strong build, this vanity is a perfect choice for any bathroom. The white artificial stone counter and white fiberboard base make a beautiful look in your bathroom. Made with a roomy double-door cabinet and drawers, this vanity has lots of room to keep items like toothpaste, towels, and hair brushes. Put together your perfect bathroom with this stylish vanity set from Wyndham Collection. With a modern look and strong design, this vanity will help any bathroom look nicer. The white artificial stone counter and white fiberboard base make a beautiful look in your bathroom. The double-door cabinet and drawers are great for putting away bathroom items. Put a nice twist on your bathroom project with this classic piece from Wyndham Collection. Use this vanity to bring more modern style into your bathroom. Its beautiful white artificial stone counter and white fiberboard base bring a great new look into your bathroom. Its double-door cabinet and drawers have lots of room to keep all of your bathroom items. This simple vanity set from Wyndham Collection will fit right into any bathroom decor. This Amare wall-mounted bathroom vanity delivers beautiful wood grain exteriors offset by modern brushed chrome door pulls. It features plentiful storage areas tucked behind sturdy soft-close doors and drawers. It was constructed of environmentally friendly, zero-emissions solid oak hardwood, engineered to prevent warping and last a lifetime. 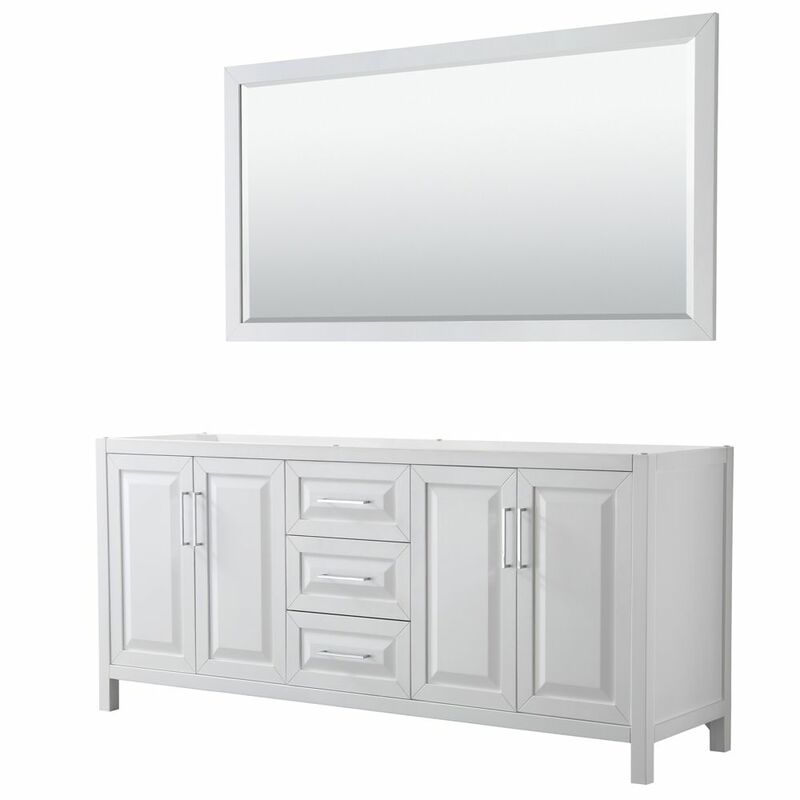 Daria 80 inch Double Vanity in White, No Top, No Sink, 70 inch Mirror The beautiful Daria collection vanities stand out in any bathroom with strong, clean lines and elegant raised panels. There's plenty of cabinet space, the fully extending drawers are dovetail construction, and chrome detailing completes the look. Daria vanities deftly combine the function of today with a nod to the elegance of the past. It's the new modern classic styling with a contemporary twist.